The Brooklyn Hacienda Black wall hung cloakroom suite combines up to date looks with practical storage. 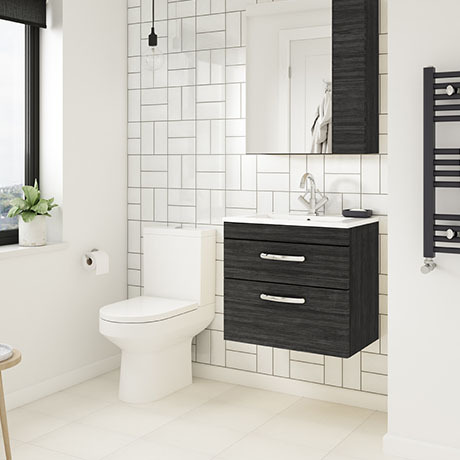 Features 2 soft close drawers and provides plenty of storage space for toiletries, the Brooklyn wall hung vanity unit is perfect for adding modern style to any bathroom. This high quality Hacienda Black textured woodgrain effect vanity unit is supplied with a smooth white gloss vitreous china stylish dual flush toilet, the simple lines of this modern toilet are complimented by its wrap over, soft close toilet seat. All units are provided with quality satin nickel handles.